AT&T: “Later Haters” (2016): In 2016, AT&T encouraged teens to use the hashtag #laterhaters to stand up against cyberbullying. They made it simple for anyone to get involved—all you had to do was send a kind text or post a positive comment to a friend’s social media account. AT&T is one of the many companies striving to change the way people interact online, and this campaign was simple enough to make a sweeping impact. The results? An impressive engagement rate of 10.13%, 100MM impressions, and increased positive online sentiment from 4% to 55%. Further, AT&T continues to educate people on Facebook’s Bullying Prevention Hub and Instagram’s Comment Filter, and also extends resources to navigate social media platforms responsibly (for both parents and children). American Express: Partners in Preservation, Main Streets campaign (2018): Through the partnership of American Express and the National Trust for Historic Preservation came “Partners in Preservation.” This campaign aims to recognize historic sites in local communities, and to protect places that matter to each of us. The “Partners in Preservation” project generated national awareness, allowing the public to #VoteYourMainStreet to help decide which Main Street should receive $2MM in funding from American Express. Because, when citizens support these historic sites, they preserve character and attract visitors to their town. With 20 projects submitted and 1,072,316 votes cast, people across the country were engaged in the campaign. 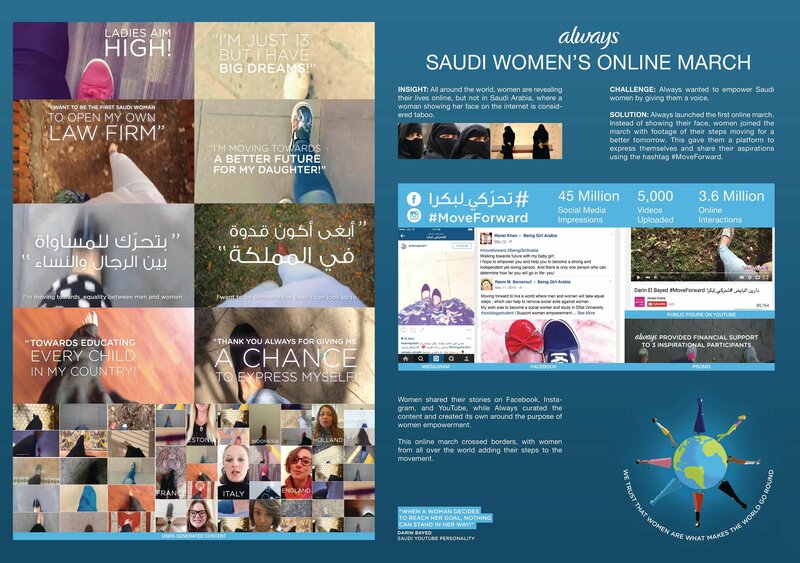 Always: “Saudi Women’s Online March” (2016): In 2016, feminine hygiene brand Always wanted to empower Saudi women by giving each of them a voice online. Rather than filming them, Always kicked off the campaign by sharing progress photos of the women achieving their personal goals (opening their own law firms, educating children in their country, creating a better future for their daughters, etc. ), paired with the hashtag #MoveForTomorrow. The campaign created a platform encouraging Saudi women to feel more confident in expressing themselves freely. And the success can be found in the results, as the campaign saw 45MM social media impressions, 5K videos uploaded, and 3.6MM online interactions.